I travel back and forth between Melbourne and Asia many times per year, often in business, more often in economy.... but never in First Class. It was time to do something about it, and with the end of BMI Diamond Club in sight, a first class redemption to Asia was in order. There were no first class seats available on Singapore airlines on the dates I wanted to travel and Thai only operate a first class cabin to Sydney so this report covers the beginning of my journey, which would eventually find me in Japan. A very early morning flight on Qantas between Melbourne and Sydney. My plan was to take the 10am flight out of Sydney to Bangkok so this meant an extremely early flight out of Melbourne, the 6am QF400 service. At 4am my alarm went off and I was up and in the shower. I had packed the night before so was well prepared to go. A quick taxi ride up to the Skybus station and I had my ticket in hand for the 4.45am airport bus. A quick check on my phone of TripIt showed all was in order with my flights currently scheduled to be on-time. Soon enough the bus arrived and myself and about 10 other earlybirds boarded it and we were on our way. At this point I realised I had forgotten my warm winter jacket which was essential for my trip to Tokyo where it was winter and subzero temperatures at night were normal! It was too late to go back so I decided I would have to pick up a new jacket in Bangkok where I was having an overnight transit, or perhaps at the airport. Just 20 minutes later the bus was arriving at Melbourne airport and I disembarked and made my way to the Qantas terminal and through security. I only had carry-on so I went straight to the lounge where they printed me a boarding pass. I settled down into a fairly empty Qantas club and grabbed some breakfast. I had fruit toast, bircher muesli and a coffee. No hot options in the lounge sadly, I needed to be over in the domestic business lounge for that but unfortunately my Qantas status was now only gold and not platinum as it once was... so I was stuck in the Qantas club. I had about 20 minutes spare before boarding was due to commence, so I watched the early morning news. At 5.40 am the lounge attendants announced the boarding of flight QF400 to Sydney. I picked up my belongings and headed to the gate. When I first made the reservation for this flight it was scheduled to be a Boeing 767-300 but about a week or 10 days before departure it was switched to a B737-800. I switched my seat allocation at the time to 13A for a bit of extra leg room. I was not disappointed when I got on board, as I discovered I was onboard one of the new Qantas 737's with audio video on demand in every seat. Nice!! The flight was full in all classes and every last seat seemed to be occupied. The passengers were mostly business types as you could expect on a weekday morning. Everyone was polite and civilised as they read their newspapers or did some last minute work on their phones or laptops during boarding. Soon enough doors were closed and the safety video (no longer featuring John Travolta) was shown. The crew still stand in the aisles to do manual demonstrations of seatbelts and life jackets whilst the video plays. At 5.57 am we pushed back and made our way to runway 27 just as the morning light was showing. A quick takeoff to the west and we were soon in cloud before popping out above it all with a beautiful sunrise in the distance. The crew soon were up and serving a cold breakfast. The tray consisted of bircher muesli, a packed of dried aprictors, orange juice and coffee cup. Apples were available upon request along with extra bottles of juice. Soon after the trays were handed out the crew came around with both tea and coffee. Suitable for a flight of 60 minutes although I still miss the hot breakfasts of the 90s. The trays were soon collected and we were on descent into Sydney where the weather was looking pretty ordinary. Quite a lot of cloud and rain around Sydney this morning. Nevertheless we made a smooth approach and touch down on runway 34L. We taxi'ed past a Thai 747 on the way in, much like the one I would be traveling on a couple of hours later. However it was not that exact aircraft, that one was performing the afternoon flight to Bangkok. 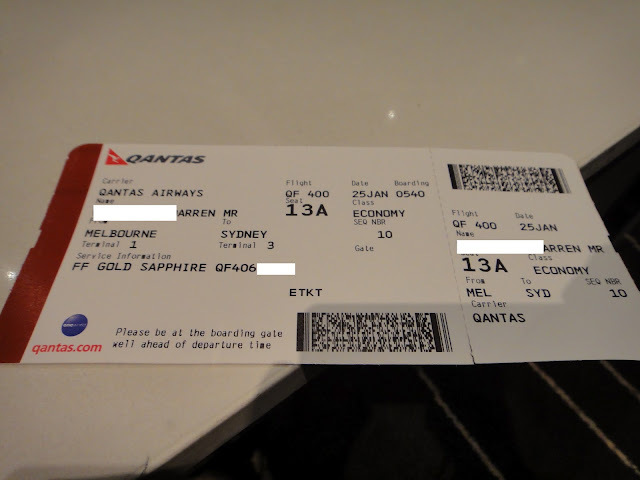 One flight down, I was now in Sydney and it was time to get the Qantas shuttle across to international to check in for my first flight out of Australia in First Class! Stay tuned for part 2. Great review! Look forward to Part 2. I remember the hot breakfasts of the 90s but that omelette holds no fond memories I have to say.